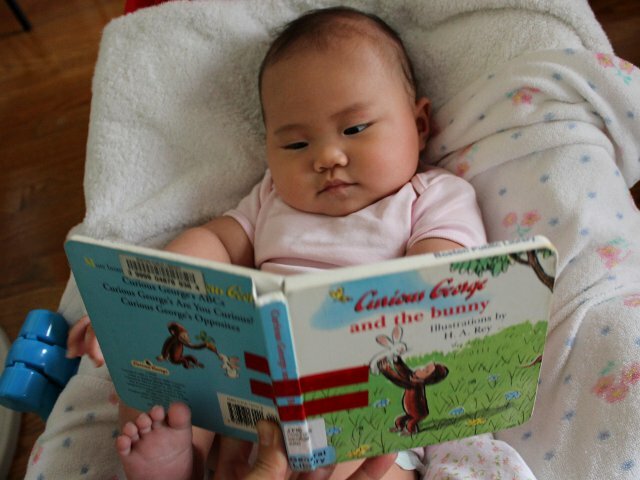 Arya has already seen four different Curious George books. Curious George and the Bunny by H.A. Rey was interesting, but not memorable enough to rank above the other Curious George books my baby and I have already read. But any book with the cute monkey on the front cover is enticing enough to choose for my daughter. Curious George and the Bunny tells the story about George stumbling upon a rabbit cage. In typical George fashion, he proceeds to open the cage to play with a bunny and sets off a series of misfortune. As with every one of his books, George eventually figures out a way to solve his problems by the end of the story. Curious George books always rest on a fine line between being mischievous and being bad. I consider George to be just naughty in this book, but other parents may have different opinions. George does wander on to private property, unlatch a closed cage, and lose an animal. But like in all Curious George books everything is restored to normal by the end of the story. The illustrations were taken from a different Curious George book written during H.A. Rey’s lifetime. Since Rey died 21 years before Curious George and the Bunny was published–and Margaret Rey died two years before publication–Curious George’s publisher, Houghton Mifflin, actually created the book. Nonetheless the story is still fluid and takes full advantage of Rey’s original illustrations. Arya liked looking at the drawings as much as any other children’s book, but there isn’t enough contrast or bright colors throughout the pictures to truly appeal to young babies. Curious George and the Bunny would be better suited for children from age two through kindergarten. With several sentences on each page and the opportunity to teach lessons about private property and caring for animals, the text is ideal for parents to read to young, school-age children. Curious George and the Bunny costs (including shipping) $5.99 new and $3.49 used from Amazon.